When most people read John Steinbeck’s The Log from the Sea of Cortez, they read it as a work of literature by a great American author. Rafe Sagarin, however, saw it as a research opportunity. After reading Steinbeck’s account of a six-week marine specimen-collecting expedition in Baja California, Sagarin decided that he could do the same trip. He chartered a boat and spent six weeks traveling the same path as Steinbeck and collected specimens along the way. When he returned, he compared his notes with those of Steinbeck to produce a report detailing the changes in marine ecology from the 1950s to today and adding valuable observational research to the field. 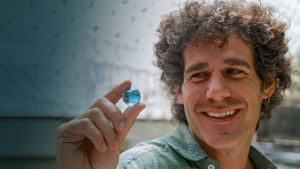 After obtaining his bachelor’s degree in earth systems biology from Stanford and his doctorate in ecology evolution and marine biology from UCSB, Sagarin started his influential and innovative career in the field. He was the author of three books and nearly a hundred scholarly articles and book chapters and he was most known for his work with the U.S. government that suggested that policymakers could learn how to fight terrorism by studying animal behavior. Sadly, in 2015, Sagarin was killed by a drunk driver at age 43 in Tucson, Arizona, where he had been working to create a functioning model of the Gulf of California as an associate research scientist at the University of Arizona. On November 21, the Western Society of Naturalists announced the 2017 award winners, Brenton T. Spies, for a paper on tidewater goby, and an honorable mention to Melissa Ward for research on carbon services in seagrass. For more information about how to set up a fund or collective giving group with the Santa Barbara Foundation, please visit our website or contact Jessica Sanchez at jsanchez@sbfoundation.org.